If you follow our Instagram or Facebook pages (or even our Twitter account), you'll no doubt see we've been growing increasingly fond of vintage whisky over the past 2-3 years - whiskies bottled in the 1960s to 1990s generally, but sometimes even older than that. Islay whiskies from years gone by can be especially good - if you ever get the chance to try a 1980s bottled Laphroaig or Lagavulin, do. They're often incredible, and completely unlike today's. Here's a good example of a 1980s bottle Ardbeg 15yo I tasted a few years ago, which blew me away. 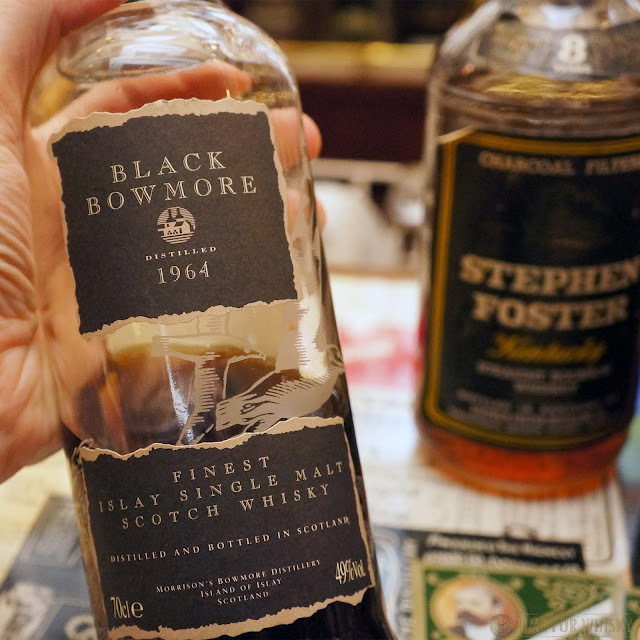 On a recent trip to Japan, I was fortunate enough to try what many consider to be the "holy grail" of sherried whiskies - Black Bowmore. For whisky fans, Black Bowmore needs no introduction. For those who haven't heard of it - despite retailing for between £65 and £125 at the time of release, bottles have sold for over £11,000, and one is now for sale for £20,000. Quite simply, it's a whisky that has attained "legendary" status. 1st edition (released 1993): 1964-1993, 29 years old. 2000 bottles released. 50% ABV. 2nd edition (released 1994): 1964-1994, 30 years old. 2000 bottles released. 50% ABV. 4th edition (released 2007): 1964-2007, 42 years old. 827 bottles released. 40.5% ABV. 5th edition (released 2016): 1964-2014, 50 years old. 159 bottles released. 40.9% ABV. A few years ago Steph and I were in Osaka, and saw the 4th edition behind the bar at Bar K. It was ¥13,000 for a half dram, and I've been kicking myself ever since for not trying it. Yes, that's an insane amount of money to spend on 15mL of whisky...but this is Black Bowmore. At today's auction prices, you're looking at many times that per dram, not taking into account the markup a bar would need to charge. I also saw it by the 25mL serve in London a few weeks ago....for £600. On a recent trip back to Bar K, unsurprisingly it was all gone (although they did have White Bowmore, which I'll write about soon). A friend who happened to be in Osaka at the same time mentioned that another bar (Rogin's Tavern about 30 minutes away in Moriguchi) had a bottle, albeit a little more expensive at ¥17,500 for a half-dram. Nose: Hugely intense, but extremely "clean" sherry, mixed in with loads of tropical fruit - passion fruit and mango predominantly. Caramel licorice allsorts. Coffee grounds. After covering the glass for a bit then opening it again, there was some intense caramel-laced coffee beans and some tobacco smoke. Just an incredible nose - one I spent at least 20 minutes with before drinking. Palate: Everything from the nose, with some added spice. HUGE mango and passionfruit, tinged with oak, allspice, glacé cherries, Brazil nuts, coffee beans, ripe peaches, leather, tobacco smoke and a very slight bitterness. Finish: Long, quite sweet and reminiscent of sherry-soaked cherries. Rating (on my very non-scientific scale): 96/100. Whiskies aren't always worthy of the hype they receive. This is, without a doubt. A truly incredible whisky. Rumour has it that there was an additional release. The Gillies Club of Australia tried and procured a decent batch of those casks in the early 1980's, and had it bottled as a 17yo. It became such an icon in the Club, that they named it 'Black Bowmore'. It was many years later that the distillery liked the idea so much they released it as an official distillery 30yo. I understand that there are still bottles of the 17yo, lurking in Australia. I have a photo, but no bottle ( yet ). Hi Michael, thanks for the comment! Yes I remember Andrew Derbidge mentioning the Australian involvement in “kicking off” the Black Bowmore series a few years ago. Thanks for the reminder - I think it’s worth me getting a few more details and updating the post. A bit like how the PSA Springbank was a precursor to the Rundlets & Kilderkins bottling. Seems we can be somewhat influential on the global Scotch market! Some of the more senior members of the Gillies Club have tasted the Club 17, and some of the official distillery bottles. In addition, one Laird Emeritus also tasted the official Maltmen's Selection ( originally GBP 100 at the distillery ) and stated that this was the closest to the legendary BB he had ever tasted. Whilst also becoming rare, it is still a whole lot cheaper than BB.